Beth is a bright, happy little snail who would love to come live at your house. She is very sociable, and loves parties. But she also likes quiet times, snuggled up with you and a good book or funny old movie. 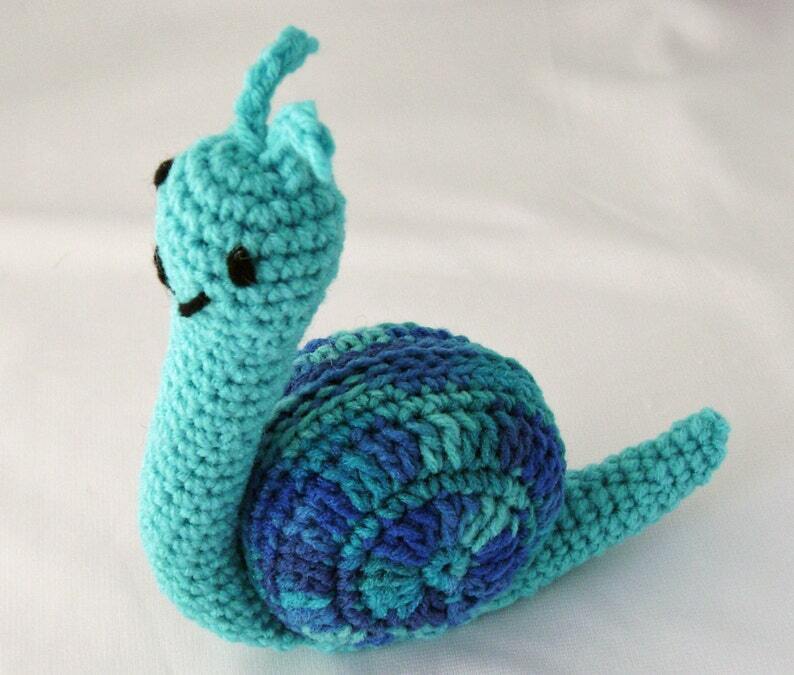 I created Beth using a variegated yarn in shades of blue and turquoise for her shell, and a solid turquoise for her body. Her eyes and mouth were embroidered with black yarn. Beth is about 7 ¾ inches (19.7 cm) tall to the top of her antenna, 7 ¾ inches(19.7 cm) long to the tip of her tail, and 2 ¼ inches (5.7 cm) wide. Beth was designed and crocheted by me, in a smoke free, dog loving home. Care instructions: Like most of my critters, Beth is machine washable on delicate, using a pillowcase or hosiery bag. She can be machine dried on low or just re-shaped and allowed to air-dry. Shipping: Within the U.S. I ship USPS First Class Mail with Confirmation. For international, including Canada, I ship USPS international first class (confirmation where available). I always combine shipping for multiple item purchases made at the same time. International customers are responsible for any customs duties levied by their country. Other custom colors are available if you would like to place an order. Just contact me via Etsy convo or via e-mail at DaffodilCornerNC [!at] hotmail.com.